Lack of customer involvement has always been a huge factor in project failure but interestingly enough also a leading factor in project success. The ultimate factor in project success is meeting customer expectations and needs. Are you familiar with the term Agile Methodology? In the world of IT, the Agile Methodology encompasses a group of software development methods that are used to guide self-organized project teams (often consisting of IT pros and business experts) to arrive at favorable end solutions by way of a streamlined, organized process. This blog first appeared on aspe-sdlc.com and is written by Kaete Piccirlli. ASPE partners with Directions Training in providing training options to businesses that seek to understand and implement effective software strategies with the power to accelerate professional capabilities. In Agile development, teams include the customers by having a person who is empowered to specify the User Stories, set priorities and to answer questions about them in order to clarify what the real project requirements. In an ideal situation, the customer is co-located with the development team, although an even better approach is to locate the team with the Customer. The effect of having the Customer working so closely with the developers is improved communication because face-to-face and verbal communication is more effective than emails and decisions that are quickly made because the customer is readily accessible allowing the team to keep moving forward. Because of its importance in ensuring the success of a project, the Customer role requires certain traits in the person to be able to make informed decisions quickly and not waffle on their answers. If they don’t know the answer to a question, they need to be able to say so and then follow through with getting the answer as quickly as possible. They need to know the business that will be supported by the system quite well. They also need to have vision for the project. Having an end-user for the customer is fine when the system of users is small; however, if the system to be used is larger it’s imperative that the customer working with the development team have a strategic vision for the system and how it will support all users. While many believe that the agile project managers or the developers have the single most important role, in Agile software development, the Customer role is the single most important and difficult on any type of project. It is especially important for an agile project due to the hands-on approach required. When possible, the Customer should be located with the development team (or the team with them) in order to facilitate communication as well as be completely dedicated to the project which will increase the chances for success. Directions Training is hosting a high-level introduction to Agile. 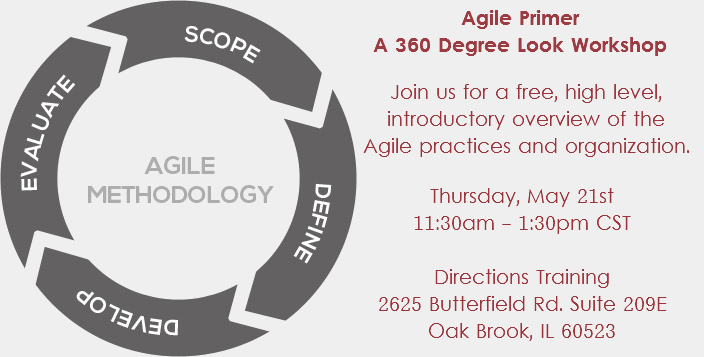 The Agile Primer – A 360 Degree Look Workshop takes place on May 21 at 11:30am in Oak Brook, IL.